There’s no argument that Australian real estate is amongst the world’s priciest. Phrases like ‘severely unaffordable’ and ‘impossibly expensive’ are not uncommon when describing the properties available in Melbourne’s inner-city suburbs. At Aston Homes, we’ve seen firsthand the trials and tribulations of home buyers being locked out of the Australian real estate market. Enjoying a modern, comfortable family home and the sense of security that comes with it should be for everyone – not just the elite few. 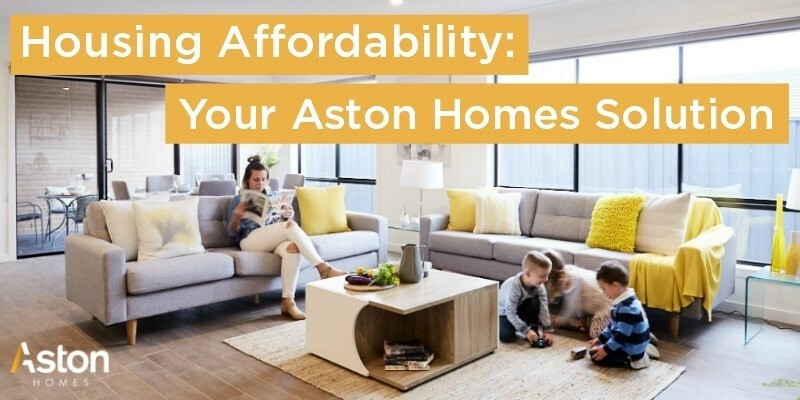 In this month’s blog, Aston Homes show you how we’re committed to providing buyers with an exceptional, affordable alternative. At Aston Homes, we’re all about transparency and being upfront with our clients. Courtesy of our many years in the building industry, we’ve observed buyers disappointed to learn that not everything they see in a display suite home is part of the advertised price. At Aston Homes, we don’t lure you in with a great price, only to charge you extra for the fixtures, fittings and fine details you love. Purchasing an affordable Aston Home at an all-inclusive price means that you receive your beautiful new residence without the stress of hidden costs. Stone benchtops? Included. Luxury bathroom and ensuite? Included. Designer tapware? Included! The list goes on. Did these these superb features come as standard in the tiny, two-bedroom townhouse you were considering in Carlton? We think not! Stepping into an Aston Homes lifestyle means making a scenic, carefully-planned Melbourne community your own. Concerned about living in a new community, or unfamiliar with Melbourne’s outer suburbs? You’re sure to enjoy hearing from clients we’ve recently built beautiful homes for who made the move to the lush outer-north. Read here as Nyrie Zougab shares her experience of living in family-friendly Mernda. Living in an affordable suburb in a new home doesn’t mean isolation or a lack of amenities. The communities Aston Homes build in have great access to public transport, shopping, parklands and schools. Melbourne’s affordable suburbs have all you need for a beautiful future, without compromising on lifestyle. We suggest you get in while you can! There’s nothing that ruins Sunday brunch plans quite like the ‘no changes to the menu’ rule on busy weekends. Poached eggs without a side of avo? Heartbreaking stuff. At Aston Homes, we’re flexible – even in our busiest of building periods. We work with families to build their dream homes. Every one of our homes has been designed with individuality and affordability in mind, offering the flexibility to add those personal touches that make a house a home – without spending the earth! Building with Aston Homes is a welcome, genuine alternative to being locked out of the real estate market as a result of the housing affordability crisis. Our expert team of builders and sales managers will work with you to select a floorplan that allows for flexibility and customisation whilst achieving the important goal of affordability. Curious to learn more about our pricing? Get in touch here.